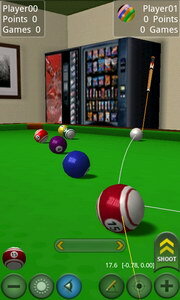 OpenGL based 3D Pool, Snooker, Carrom and Crokinole games with customizable game types and online multiplayer support. AI (computer) gameplay supports 4 difficulty levels. Compatible with Android OS 1.5 and later.